I always wanted to give my life to God. As a child, I didn't have words to describe this, nor did I have role models to show me the possibility. In my nice little Southern California suburb, I never met a swami or a nun or priest. When I was 12 or 13, I saw a movie, “The Nun’s Story.” It confused me because the nun left her order at the end of the movie. I couldn’t imagine how you could leave God! But I had no one to ask and no pathway toward what I yearned for. Until I met Baba. Not everyone wants to be a swami. I understand this. Yet many yearn for God as I did, especially when they discover God within, as their own Self. The mystical yogic path is well laid out in the land of its origin, India, but it’s a little harder to make it work in the West. Can the systematic process, for which yoga is so well known, be implemented in our modern age and in our Western world? Without losing its integrity and relliable results? I know the answer is yes, because my Guru gave me precisely this. My light skin didn’t deter him, nor my status as a mother with three children in tow. He didn’t hold back. He gave me everything, as well as a way to make it work in the midst of life. I bring all of that to you, as best as I am able. You never need to take vows. You can be a deeply practicing yogi and meditator without changing your name or the color of clothing that you wear. Your lifestyle will change as yoga grows you into your own essence, but that’s an organic process that can be done anywhere. But some of you feel an inner calling to commit yourself more deeply and to strive for more. You yearn to do it in a community of similarly committed seekers. It is for you that I have created the vowed order. The five levels interweave the ancient and modern. The sages gave us a well-defined process that every yogi goes through organically once they get Shaktipat and as they continue their practices. I’ve been watching Svaroopis go through this for decades, in a thoroughly modern way. I am grateful for the opportunity to recognize your deep commitment as well as your ever-expanding state. I feel deeply honored that you might allow me to shine the light on the pathway ahead, as well as support you or even lead you along the way. 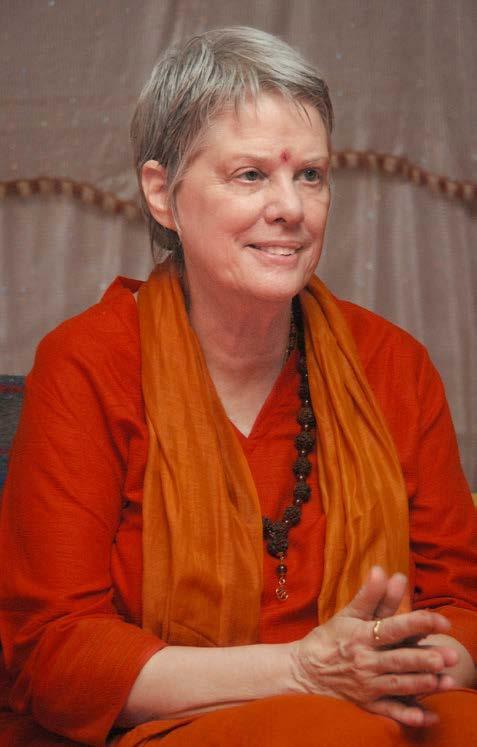 I am humbled by the ability to give the gift of Grace, Shaktipat, that fuels your journey. I am delighted to serve you in your growing freedom and Self-expression. Thank you for asking me to do this for you. The inner calling is the highest form of Grace, your own Self calling you to look for your own Self.